You’ve got the skills. You can appliqué without a pucker, your piecing is on point, and your hand stitching is neat as a pin. So why not showcase all of that talent of yours in a beautiful handbag that’ll wow your friends? 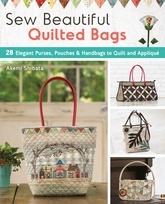 In Sew Beautiful Quilted Bags, Japanese quilt artist Akemi Shibata shows you how to make 28 distinctive, detailed bags that have decorative elements like pretty embroidered accents and sweet appliqués. There’s a log cabin backpack that converts into a messenger bag; an envelope shoulder bag that converts into a tote; a rectangular boxy bag with a pretty tree motif that holds more than you’d think; a sweet sewing case edged with piping; and lots large and small of purses that are stylish and fun to make.